When away from what we think of as home, we try our best to make wherever we are our home. For about a month my wife and I traversed Canada, traveled down to Tennessee, and finally made our way back across Interstate 40 to return home to Los Angeles. We essentially lived out of our 2014 Chrysler Town and Country Van, hauling stuff in and out of motel rooms and relatives houses to stay for the night or several days whichever the case may have been. For road life it was pretty luxurious. No roughing it in the wilds or sleeping in the vehicle. We traveled in comfort with air conditioning and a good sound system connected to satellite radio. When we were hungry we stopped at restaurants to eat. Some folks might still find this to be somewhat tedious, but we had a great time even considering some of the long driving days we experienced. I'll be inserting some vacation photos in upcoming blog posts, but in all honesty I'm bad at taking pictures. When I'm having a good time I tend to get wrapped up in living and forget about capturing those moments for posterity. In other words there won't be many photos and they probably won't be all that good. My wife took the photo below of me standing in front of the Parliament Building in Ottawa, Ontario where we stopped in to see the changing of the guard. I shot some video of that, but I won't bore you with that here. Instead I'll bore you with this picture of me wearing my Panama hat as we awaited the ceremony on our last day in Canada. In all we spent seven days (and six nights) in Canada. It was a great adventure that passed far too quickly. We've decided that we want to do something similar again and see more sights and hopefully at a more leisurely pace. So much to see and so little time! That's not to mention the great United States which we still have so much more to visit. This trip incorporated over 9000 miles of driving in 33 days. We spent a lot of that time visiting in New Jersey and Tennessee so it's not like we were always in our van driving. I'd better be careful writing these posts. I'm already missing the road life. Home in my house is nice, but I can make myself feel at home just about anywhere I go as long as the company is good and the comfort level is passable. Home might be where my heart is as the old saying goes, but home can also be wherever I make it. 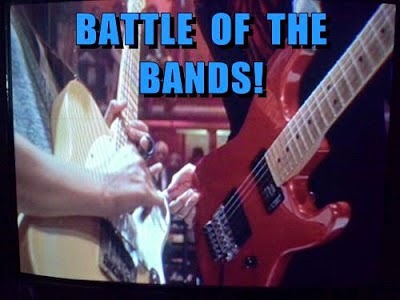 My Battle of the Bands round this time was with versions of "You'd Be So Nice to Come Home To" by Anita O'Day and Julie London. In all, this was a pretty evenly matched pairing that could have probably gone either way with most of the voters. That's how it was for me at least. I went back and forth with these two renditions and changed my inclination in voting a few times. In the end though I decided on Julie London's faster paced version. If I could have used it I would have voted for the melancholy Frank Sinatra/June Hutton version, but apparently it may not have been available for viewing in all countries. Maybe it seems incongruent that I would end up voting for a faster paced version, but to me the London version seemed cleaner, musically sharper. The arrangements of both versions were very similar other than tempo. O'Day's version is fantastic, but London's version had the greater appeal for me. The majority of voters saw it otherwise. Next Battle on September 1st! 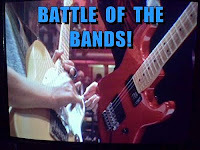 The Battle on Thursday of next week will be quite different than the one I just did, but in a type of music that I've used before and one that I enjoy a great deal. Some might find the song a bit strange, but I hope you'll still play along and maybe expand you musical horizons in doing so. It's a rather sensual song that won music awards, hit the charts, and received extensive radio play in 2000 though it's likely a song most of my readers have never heard of. Be sure to check it out on September 1st. Are you able to make yourself at home just about anywhere you go? Have you traveled the Trans-Canada Highway? How would you feel about selling your home and living on the road? I am so pleased you have enjoyed your travells. It's grand visiting places one only see on YV. That's how I felt whe on the occasions I have come to the US and Canada. It is however lovely to return home and get your life back to normal. I voted for Frank Sinatra, but the others were equally good. Yvonne, I like to see travel shows about places I've been for comparison to what I experienced and see shows about places I plan to go one day so I have an idea what to expect. Frank Sinatra was not a competitor in this Battle, but that's who I wanted to vote for if he had been. Nine thousand miles? That's just too many miles behind really slow drivers for me. Glad you never had to sleep in your van. I've gotten better about taking photos now that I have an iPhone. Before, I was as wrapped up in the moment as you. Alex, not all that much time was spent behind slow drivers as the highways are pretty open most of the time and traveling is fast and smooth. Actually I did sleep in the van sometimes while my wife drove, but never spent a night in it thank goodness. My wife took a lot of pictures on her iPhone, but I don't do that either. Well, my thought on it is that any time a BOTB ends with a margin of victory of 5 votes or less, it was a good, competitive Battle. So this one's right there in that pocket, Lee. STMcC, I thought this was an excellent outcome, but I'm satisfied as long as all contestants get at least a few votes. I'm getting my next Battle prepared now and it's almost ready for debut. That was a monumental journey, Lee! You look spiffy in your hat. ☺ Hubby and I love road tripping, but so far, ours have been relatively short. We would definitely enjoy longer trips. One I've been dreaming of: Toronto to Vancouver to San Francisco to San Diego, then home via Las Vegas. I went with the crowd on this battle. Nice to see it was close, as both versions were good. Looking forward to your next one! Debbie D, your dream trip sounds pretty similar to ours. You should do it as soon as you can--before time or circumstances get in the way. I take my camera everywhere and like you, I forget to use it :-) Great picture of you, love that hat! That is one impressive building behind you. I prefer short trips but I can tell you're comfortable wherever you are. I bet every trip is an adventure for you and I look forward to more pictures of your latest. Keep thinking the good thoughts, they look good on you! Diedre, I'm always try to think good thoughts, but bad things keep happening around me. Enjoy your week, good buddy Lee! Shady, in this Battle it was not so much of a matter of matching tastes as I liked both versions almost equally--but one just a tad more than the other. Nice to know you were in our part of the continent, well, Canada anyway. One of my daughters will be moving to Ontario in a month or so. I hope to do a cross Canada tour with hubs in a year or two, as we have relatives in Saskatchewan, Manitoba, and now Ontario. I want to see the east coast of Canada. I've travelled up and down the east coast (but not New England) and across the southern edge of the US, and up the western side, but not through the middle (I have little interest in any prairie type country, I like the coastal areas). AS for the BOTBs, I liked this one, those old songs never get old to me. Forgot to say, the cross country trip will be on a train going and we would likely fly back. I have to consider hubs may have to be in a wheelchair. We both like trains. . .it's a plan anyway. DG, I like trains too. A while back I investigated the train tour across Canada and it seemed quite expensive. But I'm sure it would be quite a trip to remember. I used to think similar to you about the middle states (the "prairie type country") until I started traveling those states extensively and grew to appreciate them a great deal. Just in passing there seems to be a boring sameness to it all, but when you start exploring in more detail there are many treasures to be discovered both historically and scenically. Everyplace seems to have a unique quality that sometimes needs time to appreciate. I always thought it would be neat to get a luxary RV and go across Canada and then down through the states and up here again. But then that costs loads of dough and one needs to be retired. Rich and retired, the best R's around lol home can be anywhere though, as long as it isn't he middle of the woods, desert, ocean, space, a jungle, etc. Pat, well, I'm retired, but I'm not rich so the RV thing is out of the question for now. It does sound like a fun adventure though if I were financed in some way to do it. I'd imagine that home could potentially be even in the places you mention if the circumstances were right. That was one epic road trip! I like to take photos and my wife likes to drive, so road trips work out great for us. Pat, I wish I'd be as diligent as you in taking photos. You display some wonderful photos at your site. Glad you had fun traveling. Yeah I wouldn't be roughing it in the woods either so good for you. Sheena-kay, I did my outdoor adventuring in my younger days and was fine with it then. Now I prefer to have a comfortable bed, a roof over my head, and a bathroom nearby. Hilary, if we had the money and my wife didn't have to work anymore then we'd probably take a few trips each year. Sounds like you had a great trip. What fun to just meander along as you pleased, and I know you were happy to see family, too. Nonetheless, welcome home! Liza, though we did meander to some extent, we were still on a fairly rigid time schedule. Maybe someday we'll slow things down even more. Those are some really good numbers for your battle! Am looking forward to your Sept 1 battle. You always have some interesting ones. Mary, I thought the outcome was good in this Battle, but the contestants were on a pretty even playing field. I'll be interested to see what the reaction is to my next match-up. My husband and I have not taken a really good road trip since 1998 when we migrated from Florida to Colorado, visiting a bunch of potential retirement cities along the way. Taking the drive across Canada or touring the northwest U.S. would be seeing territory we haven't explored before. That would be a lot of fun...and I'd probably forget to take pictures too. Patricia, I love going to new places and seeing new sites. I do need to start getting better with taking pictures though. To me, there's no place like home. I like traveling and visiting others but I'm always happy to get home. But I really dig road-tripping so I'm sure I could really handle a vacation like the one you had. Like you said, the company has to be good. Good battle. I voted for Anita so glad she won. Michele, a vacation with people I couldn't tolerate would be no vacation at all. If it was just me I would not have a problem living on the road. Mike, same for me--as long as I had plenty of money. However, sharing experiences with someone I love can be mighty rewarding. Loni, driving is usually relaxing for me as long as traffic isn't crazy. With so many road miles behind me over the years, driving is a natural state for me. Your trip sounds great Arlee, the kind I like. Stopping when we feel like it, taking time totally chill enjoying the scenery. That's some mileage you covered! Well done! Susan S, even this tripped was more rigid than I would have liked. 250 miles a day or less instead of 500 plus would be nice. Living on the road might feel fun, exciting, and romantic at first, but I'd ultimately like one place to call home. I'd love to visit Canada someday, particularly Toronto and Vancouver Island. With my history of motion sickness, I don't know if I could handle over 9,000 miles in 33 days! I can also hear my mother nagging about how my car supposedly couldn't handle such a big trip, though I have no plans to replace my car like she thinks I need to. It'll only be 10 years old in November, and has I believe about 83,000 miles. Carrie-Anne, you're good for another 100,000 miles at least if you've been taking good care of your car. I would looooooove to get an RV and see all of North America. That would be so much fun and is one of our dreams. JoJo, don't stop believing! You can do it! I'm pretty good about adapting when I travel. I wouldn't say it feels like home, but that's okay, because when I'm traveling I want an escape, an adventure. I'm not sure I could be permanently on the road, though. For me, it's nice to have some place to return to. JH, we're looking forward to another Canadian adventure! One where we can spend a little more time in places rather than whizzing through. We are serious travelers. My husband is a college professor, so we have spend most summers away from home, for all or part. Many summers it was a temporary apartment or similar in Boulder, CO, where he did research. Other years we do long road trips. Three years ago we spent a month in the Canadian Rockies. Unlike you, we spent every night in our tents, which meant that we were always at home--our own familiar stuff (this was a huge bonus when the kids were little, as they didn't have to adjust to new digs while on the road). I like a month-long road/trail trip, and look forward to retirement when we'll try some even longer ones.